A tree passing through the four seasons representing the cycle of life is nestled in an archway. At the top are buildings from Jerusalem including Montefiore’s windmill, the Shrine of the Book, the Tower of David, the Western Wall and the “Hurva.” A landscape of Israel surrounds the arch. The leafy border is filled with ceremonial symbols and eight words from the “Seven Wedding Blessings“ which mean peace, joy, friendship, happiness, companionship, love. 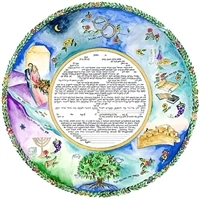 This richly colored piece features a couple floating beneath a chuppah glowing with the warmth of the sun. Other symbols include two interlocking rings representing commitment, a tree with pomegranates and doves representing family and peace, an image of Jerusalem, and images representing Judaism and learning. There are quotations floating throughout the artwork which refer to love, learning, and building a home together. Size: 18" dia. 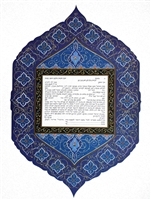 (Giclee) The rich colors and Persian motif of this ketubah hint of a magic carpet ready to transport the betrothed into matrimonial bliss.